I will admit it, Sword Art Online is not actually an anime series I have watched. Being the chief editor for Sword Buyers Guide, It has actually been many, many years since I have had anything close to resembling "free time" - but having owned, tested and handled hundreds of swords over the years, I feel I am qualified to at least review this particular piece from a purely "sword enthusiast" point of view. 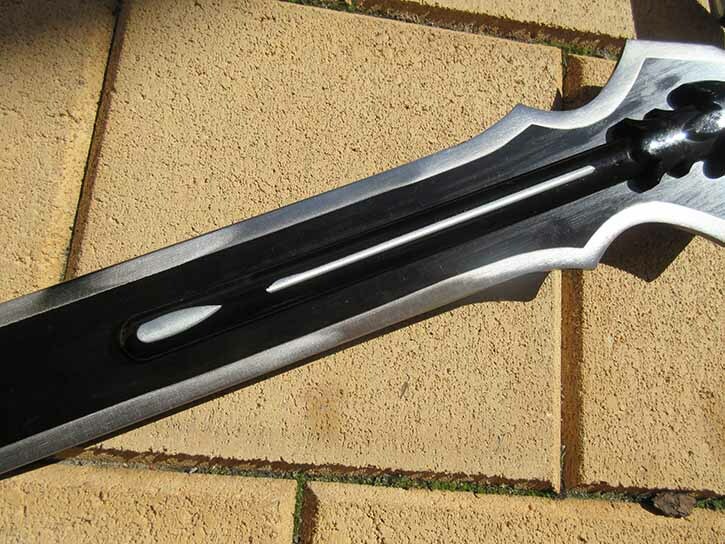 Because, as a fan of fantasy swords in general, this replica - which has never been marketed or expected to be a "battle ready" or functional piece, is certainly some quite attractive eye candy.. I have done some preliminary research on this piece and it appears to be based on an "unnamed longsword" wielded by the protagonist of Sword Art Online, Kirito, in the latter half of season one and into season two of this popular anime series. But in this review, I will be taking it a lot further than just a visual examination or comparison to the Sword Art Online original - because there were some indications that this particular piece was not just the usual run of the mill, stainless steel wall hanger, but had some potential as a functional piece. Which if true, considering its $50 price point, would make it quite a remarkable buy.. 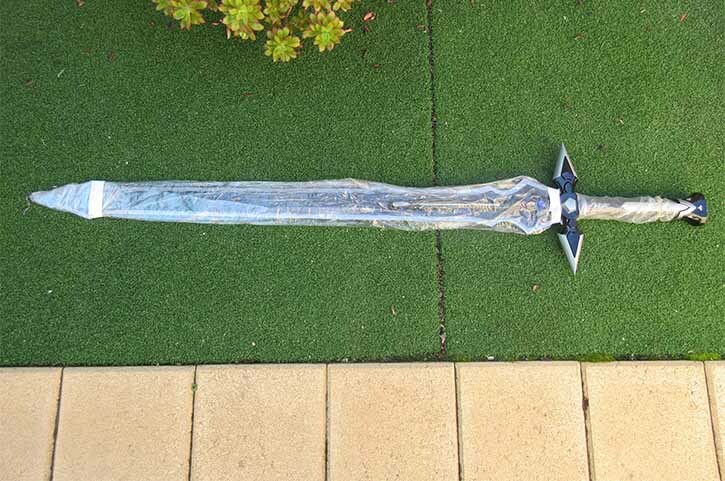 The first thing I noticed about this sword when I receive it was that it felt very heavy and substantial and I was more than a little curious to see what it looked like under all the plastic and bubble wrap that protected it in transit. 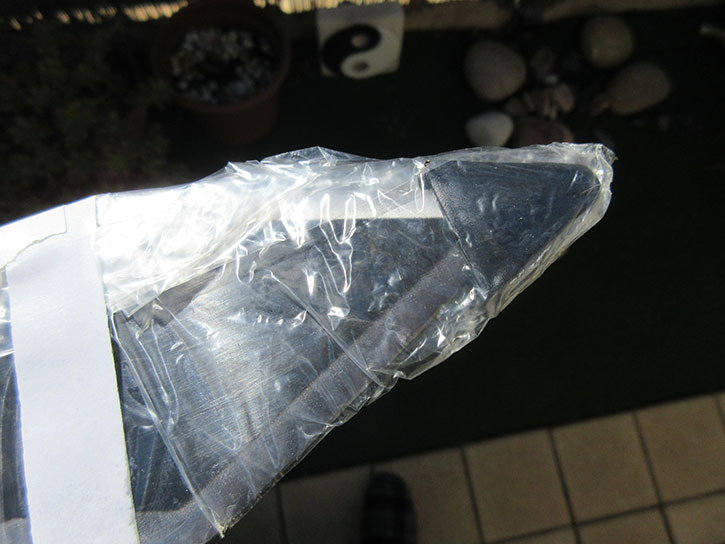 While the spiked hand guard did manage to pop out of the box somewhat, the tip was protected by a plastic guard, so that at least any courier or postal worker handling it would not get a sudden, nasty surprise.. Stripping away the plastic sleeve, I was surprised to find that the sword had a light coating of oil and did not feel or look like stainless steel - which was confirmed by a simple magnet test (stainless steel is non magnetic) and by cross referencing from a manufacturers sword catalog which identified it as 1045 carbon steel - the basic steel for a fully functional blade..! From a functional swords point of view, the edge was unsharpened, but the spatulate tip, quite pointed suggesting that the plastic guard was essential.. Even though this design has never been seen on a historical sword and is clearly something that would only really work in the VR universe of Sword Art Online, it was actually quite innovative, kind of like a spear tip with axe like edges and is the business end of the sword. 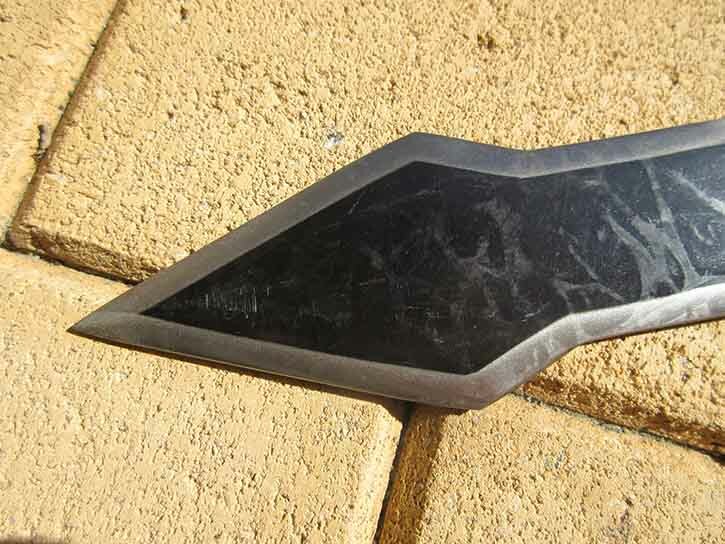 But the rest of the blade itself was also nicely executed, with a black anodized finish over the surface and steel edges giving it a distinctive and very mean looking appearance. 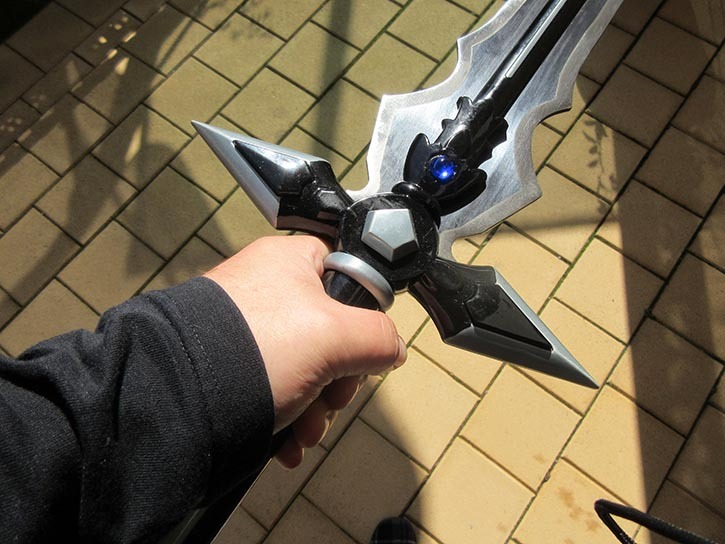 Being marketed as a decorative piece - suitable for display or cosplay, it is not sharpened. But because it is made from 1045 carbon steel COULD be honed if so desired (more on this later). 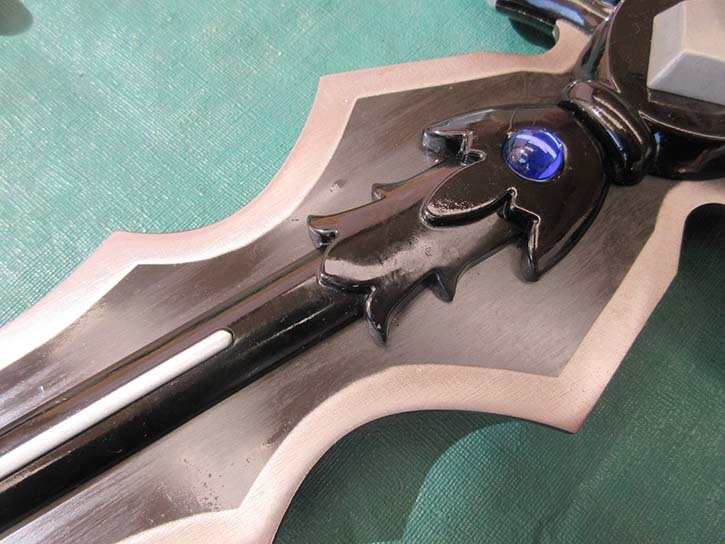 Towards the hilt, the blade also becomes very ornate and intricate, and closely follows the design of the blade seen in the Sword Art Online series, albiet of the "Dark Repulser" (which is actually teal/aqua colored).. Whether or not it is accurate, I don't know - but I certainly found the overall design very unique. 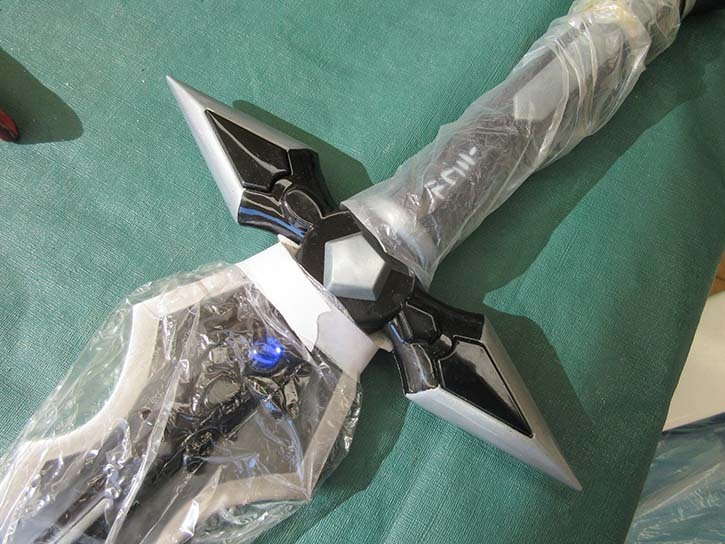 While it had some elements common to fantasy swords in general, it was clear that the designers of the Sword Art Online series had spent a lot of time and thought into making it different but somehow familiar. Overall, for $50, I was very impressed by what I was seeing. And it only got better.. The unique, double spiked crossguard of this sword is one of its most distinctive features and follows the same black and silver tone as the rest of the design. Assembly wise, it was actually pretty tight - with only the slightest wiggle at the silver ring spacer between the guard and the handle. 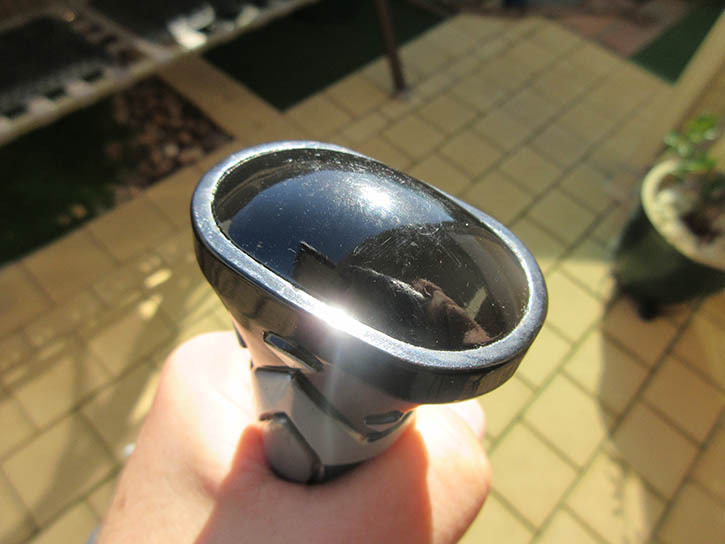 The crossguard itself is smooth and nicely tapered, terminating in two points and feels quiet solid - though it is actually made from cast zinc alumimum, so is not quite as solid as it might first appear. 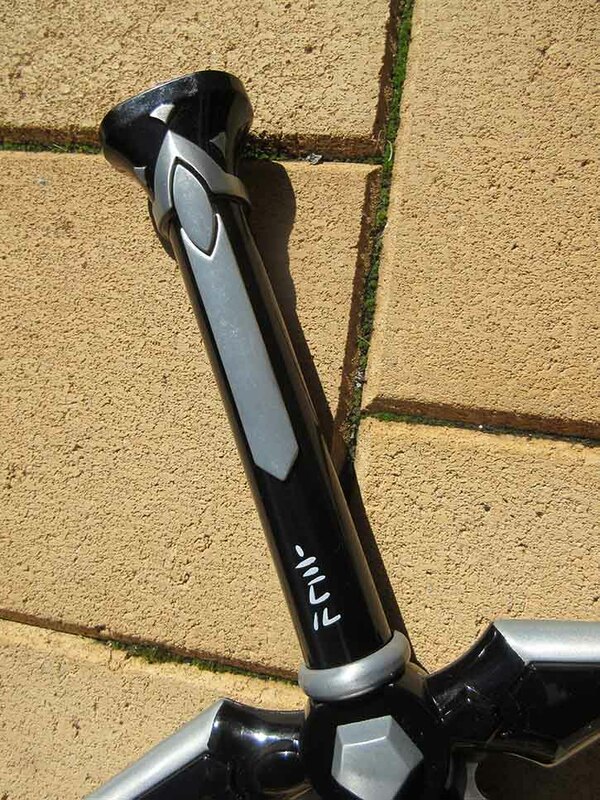 The handle has a cool, very futuristic yet minimalist design and appears to be heavily epoxied in place. Despite being conversantionally more or less fluent in Japanese and being able to read and write the language, I am puzzled by the Katakana script on the handle.. 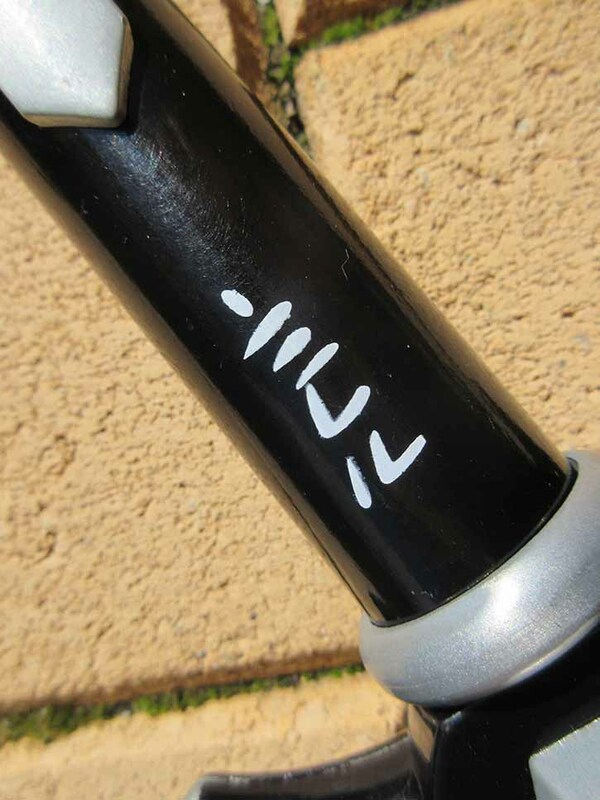 It looks cool, but appears to be kind of made up or mirror image (something, reverse "ko" and "ru"). Maybe it is intentional, but having not seen Sword Art Online, leaves me scratching my head..
Moving on, the actual pommel is big, nicely shaped and epoxied into place - but feels very solid. Overall, the whole thing is nicely done. 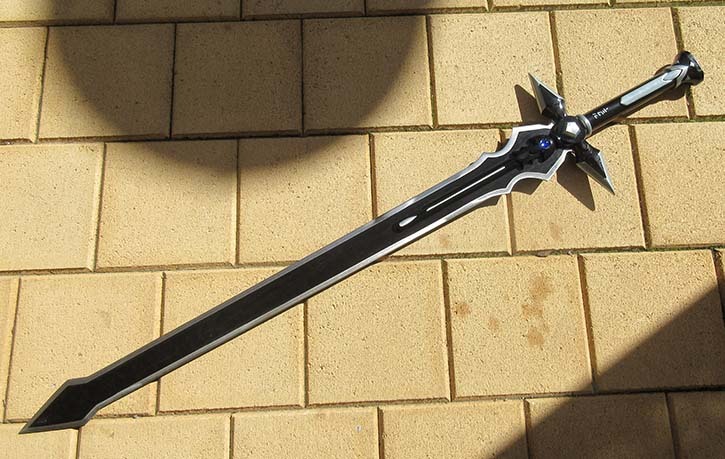 As a display sword, it totally rocks - even if it may not be quite an accurate replica of the sword seen in Sword Art Online.. But even though it is a decorative piece, at SBG we always like to push the envelope a bit to see how well it may, or may not, hold up to some actual use.. While it is really too heavy overall to use one handed, you CAN give this sword a good two handed swing or two without any fear of it coming apart. While it could be classes as being somewhat sluggish, the forward weight of the blade would make it quite a powerful cutter if it was actually used, and I am very confident to say that no matter how much "dry handling" you did with this sword, it would NEVER come apart in your hand..
How am I so confident to say this? Because, in true SBG fashion, I put the thing through the wringer, testing it to failure..
My first test was pretty simple - cut a watermelon in half. And despite my first cuts being a little too high and just skimming off the skin of the watermelon, the unsharpened edge was more than good enough to cut a watermelon neatly when it made contact in the center. So far so good, but the ultimate test was a very abusive one - slamming it time and time again into a secured wooden pell..! As you can see, it did some serious damage to the post - and when it did inevitably fail (as this is a test that even truly functional swords often struggle with) it was only the cross-guard and associated bits and pieces that fell apart - and could easily be glued back on. 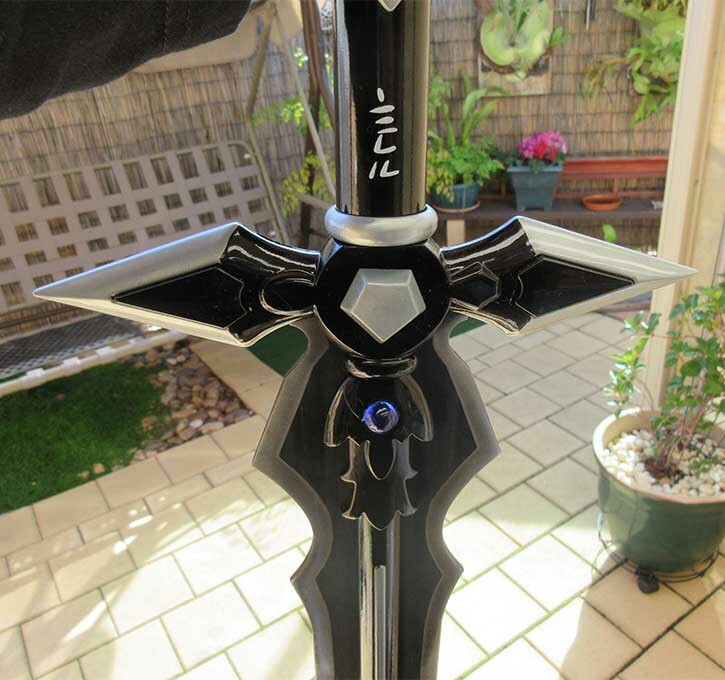 The actual hilt was as solid as when it first arrived..
To say that this replica sword from Sword Art Online impressed me is an understatement. It looks awesome, it is incredibly cheap and - for a decorative sword - is as tough as nails (even though the carbon steel blade is unsharpened and untempered, it CAN cut and kept its shape despite my attempts to deform it). I will let fans of the series decide if it is accurate or not, but for more casual collectors and fans of anime and fantasy swords in general, this one is a must have. 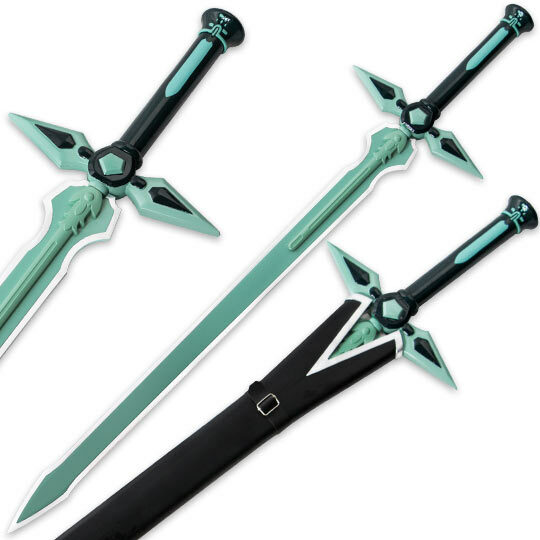 This sword is available here at Trueswords.com and currently on special for $39.97, which for a sword of this quality and durability is an absolute steal.